Stockholm (AINA) — In Turkey today there are more journalists detained without charge than anywhere else in the world. Many have been detained for years without knowing why. Turkey has recently made itself known for imprisoning journalists and opposition members to such an extent that the country now stands first among countries with state censorship. Turkey, a candidate for EU membership, has even passed dictatorships like China and Iran in the number of imprisoned journalists. 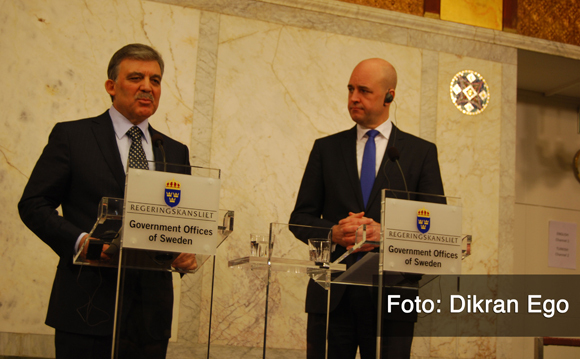 Turkey’s President Abdullah Gül was on a state visit to Sweden between March 11 and 13, where he spoke on several occasions about the success Turkey has had on the democratization process affecting the country. But reality is always more spectacular. During the Turkish press conference my journalist colleague Murat Kuseyri and myself experienced what Turkish ”democracy” and ”censorship” means in practice. This happened in the heart of Stockholm just an hour after Abdullah Gül’s speech at the Riksdag, where he spoke about historical relations, trades with Sweden and the now ten years long process of democracy in Turkey. My colleague and I were denied entry to the press conference at the Grand Hotel in Stockholm, where journalists were given the opportunity to direct questions to Abdullah Gül. The Turkish press officer who commanded the press conference with an iron hand rejected me and my colleague. The reason for the rejection was because one of us represents an Assyrian TV channel advocating for Assyrians who are a minority in Turkey and the other represents the liberal newspaper Evrensel, which is classified as the opposition. The entire incident took place in front of staff members from the Swedish Forgein Ministry’s press room, but they could not intervene because they lacked jurisdiction over the press conference. This incident is not only embarrassing for the Turkish delegation but a demonstration of how journalists are treated in Turkey. As journalists, my colleague and I were accredited by the Swedish Foreign Minitrys’s press room to monitor President Abdullah Gül’s state visit. Our mission was to monitor and report from the state visit. Throughout the visit we have successfully been able to report freely and have worked with stories, just as planned. But things completely changed when the Turkish staff controlled who would gain admission. Not only were our democratic rights violated, but the Turkish staff also practiced the Turkish way of democracy, where censorship is one of the pillars. There is only room for which applauds Turkey in their way of viewing the world. In the version of democracy advocated by Abdullah Gül, there is no place for two journalists who are not like-minded.